I might own the oldest curling iron known to man, I have no idea where it came from, but it's served me well over the many years I've had it. This is a great technique for those of you looking to achieve beachy, undone waves, but want to avoid the "Shirley Temple" effect that traditional curling irons are known to cause. Unlike most of my tutorials, I recommend starting with clean hair, simply because it's easier to break apart the curls once they're set. This is my go-to hairstyle lately, if I'm running low on time in the morning- which, let's face it, is always- I can throw in a few curls in the top layer and curl the ends and I'm done. Happy styling! Love this post. So pretty and easy. I need to purchase a curling iron. My hairs getting pretty long and I'm looking for new easy styles. Out of curiosity what kind of hairspray do you use? Hope you are having a great day! This seems simple enough! I'm doing it right now! Great tutorial! I cannot wait till my hair is long enough again to really start being able to curl it! Also oh my word I don't think I had realized just how long your hair was, I love it! That is a NICE effect. Kind of makes me wish I still had hair, man. The pixie is suiting me well, though. I love how easy this tutorial it! It's hard to find tons of time to spend on hair in the morning! i LOVE this tutorial! i am definitely trying it, never tried twisting my hair before curling! of course i will be trying this! your hair looks amazing as always and i want it! I think my hair is almost the same length as yours, but I'm extremely jealous of how thick yours is! your hair is amazing - wish mine was as long as yours!! ooh i love it. your hair is super pretty like this :) and i'm a fan of the fact that it starts with clean hair, cause secretly it freaks me out to touch my dirty hair. ha. Awesome! I'll give this a go. btw, I'm super envious of the volume your hair has at the top of your head. Mine sits pretty flat to skull, and having long heavy hair defats attempts to make it do otherwise. TY! i always love to see how you fix your hair! WOw! i love how long your hair is! 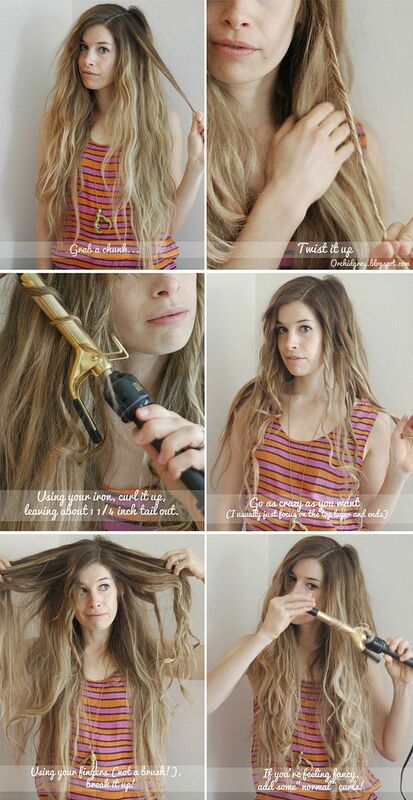 i've been looking for a quick way to curl my hair too. Not that i'm short on time. I'm just short on patience. Can't sit still with my curling iron for half an hour and curl my whole head!